Is a smoking jacket really meant for smoking? I have no idea, but these socks are made for drinking. These were originally intended as a Christmas gift for Chris, and as you can likely guess, that didn’t work out so well. I posted here about my knitting fail when I finished the first of this pair. I was not about to rip back, so I decided to make the second sock and call them mine, since the first sock (barely) fit me. 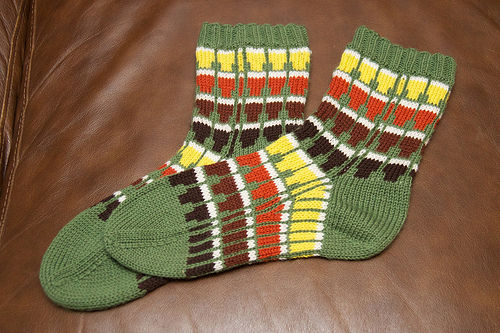 The second of the pair is a little looser than the first, as seems to be the way with my colourwork projects. Putting on that first sock kind of freaks me out as I wrench the poor tight thing over my heel. Anyway, I do intend to make Chris a pair of his own. I made this pair with Stroll by Knitpicks, and I had bumped up the needle size intending them to be big enough for him, but no luck. I instead have ordered Stroll Sport, which is a thicker yarn, and I’ll have to go even bigger with the needles, as well as make some pattern mods. 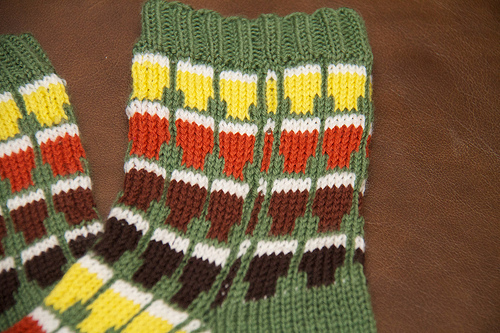 I also plan to just put the pints on the cuff, to allow the sock to be stretchier across the foot/heel, and hopefully, hopefully (note my prayer here to the knitting gods), they’ll fit him. If I ever get around to them. I think I’m good with the colourwork for a while. Maybe it’s time for something a little less risky?